Welcome to Part 2 of my interview with the talented artist and furniture designer, John Houshmand. In Part 1 of the interview, John described his imaginative furniture-making and process. To read all about it, click HERE. Below John Houshmand kindly takes us behind the design of his own retreat - Villa Tierra Adento in San Miguel de Allende, a hidden treasure with a thriving artist’s community, and a shoppers paradise for finding odd and interesting things. 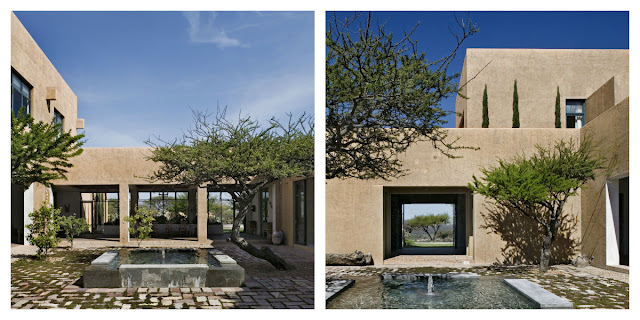 The villa’s elemental architecture is breathtaking...encompassing air, earth, fire, water, and metal,…its pure geometry is set perfectly and born from the desert’s landscape. Oh! 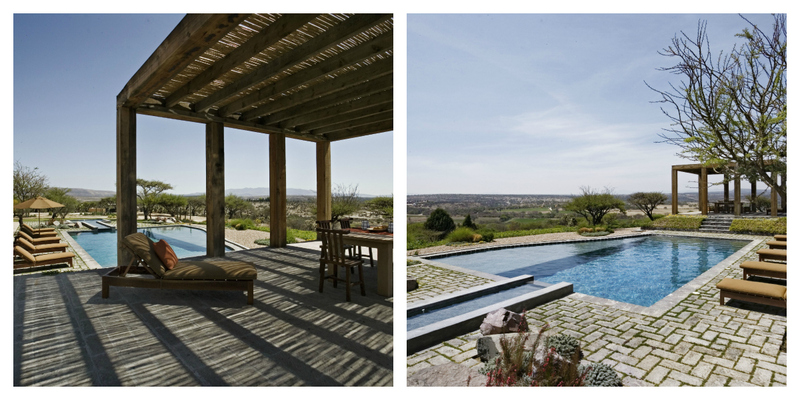 the views, especially by the pool! The house is meant for tired city dwellers to escape. I wouldn't mind being a guest! 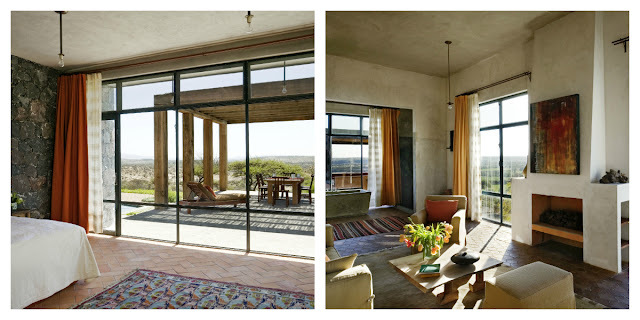 John Houshmand recounts his experiences designing his home. "Working with my friend and colleague David Howell on my house in San Miguel de Allende was perhaps the greatest yet the most fulfilling challenge. It involved shared egos, shared vision, four years, a huge project of 12,000 square feet of house, 8,000 square feet of patio, on almost 9 acres of land, with 360 degree views." 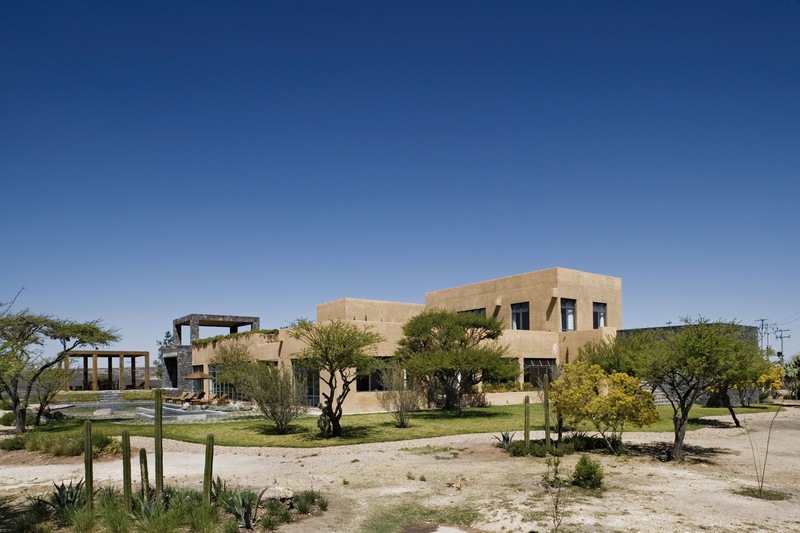 John adds,"We built in the local material and technology vernacular to a sensual minimalist design around a hacienda program, and got a result that is amazing. I wore every hat on that one, and it was in a foreign country. The result is a testimony to a truly challenging and special process." "The rooms are all arranged around a courtyard replete with lemon and orange trees and a tranquil fountain. 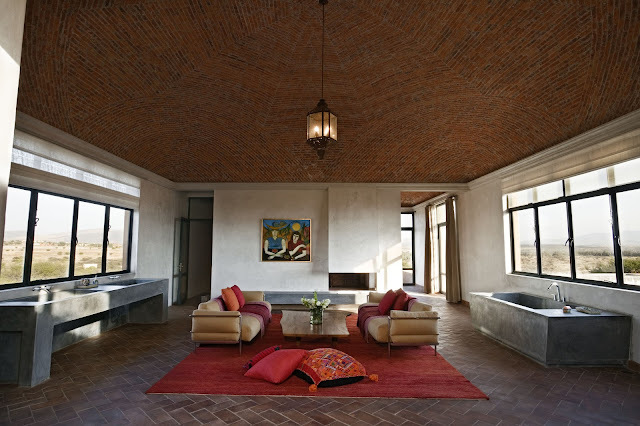 The traditional dimensions (4 meter ceiling heights etc) are merged with the traditional building methods (boveda brick-domed ceilings, viga flat ceilings, terracotta tile, wood oven in kitchen, the pyramid-in-pool feature, the stone construction of the 'music room' and the 'gallery', and more. Even the color of the house was taken from the earthen color of the hill upon which it stands. But all these features were abstracted into pure forms, and the colonial details were left out totally... no wrought iron, no curved arches, all these were ignored in favor of a powerful and elegant simplicity." The interior spaces are as special as the exterior. 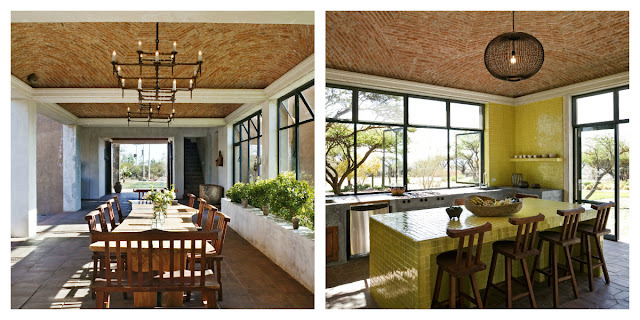 I really love the beautiful architectural and furnishing features such as the grandeur of each space; the large spans of glass allowing the outside views in; the movement and texture of the brick boveda ceilings; the sunny and warm red-orange-yellow accent colors and John's own animate furniture pieces. Inspiring! Take the journey inside with John.... "The interior design was accomplished as a collaboration with architect David Howell and his wife interior designer Steffani Aarons. 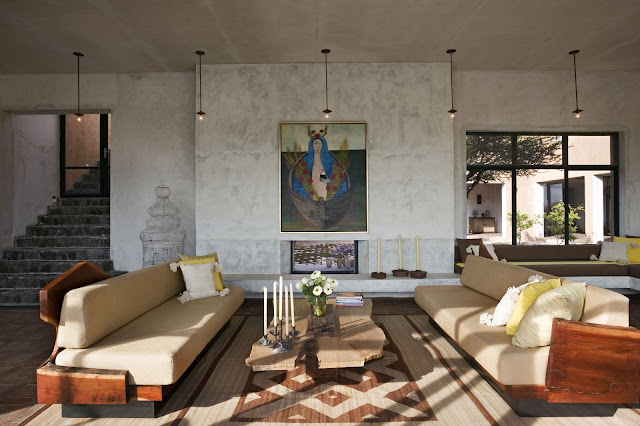 The architecture was to be a canvas upon which to paint the art, furniture, and collected items that honor the Mexican hand and heart (Mexico has the largest number of artisans in the world), as well as the work of friends and my furniture design. Pieces were gathered from the roadside antiques stores, San Miguel’s shops and artists, and more. All upholstery, curtains, and fabrics were done from local shops...."
Thank you again John for the eloquent interview! local artisans and materials into the architectural design. Beautiful! you can link to his WEBSITE, BLOG, FACEBOOK, and TWITTER.